FYI, the 2012 recruiting board lives here. 6-5, 205. Hails from Farmington Hills, MI (Harrison). One of the two TE's so far in the 2012 class. He goes first in this post because we love the hat. 6-2, 215. 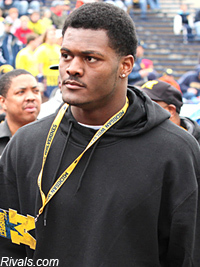 Hails from Detroit's Cass Tech High School...same HS as Michigan DT Will Campbell. The sites are a little split with his position with 3 having him a OLB, but Scout listing him as middle. 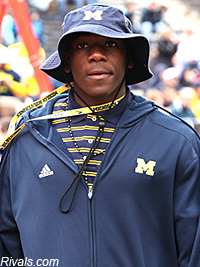 No question, this is probably one of the top recruits so far in the 2012 class. Alabama, Arizona St, Cincy, Florida, Indiana, Iowa, Miami (FL), Sparty, Missou, Oklahoma, Pitt, Syracuse, Tennessee. 6-6, 260. Hails from Cincinnati, OH (Sycamore). Another TE prospect for the 2012 class. He boasts a slightly larger frame than Funchess. That added size should bode well for blocking. And his height will make him an easy target for any type of QB. Interesting note...Williams was recruited by Indiana's Greg Frey, former offensive line coach at Michigan under the Rodriguez administration. Indiana, which you might have noticed has offered all 3 guys in this post. I personally really like coach Frey, I had a chance to chat with him last year during media day. I think Indiana will be much better off with him as their OL coach. Arkansas, Boston College, Illinois, Indiana, Louisville, Sparty, NC State, Vandy, West Virginia.